Now the Trans-Pacific Partnership (TPP) is being sold with literally the same promises. Here is why TPP is not going to work out better than NAFTA did. Note the pitch used to sell NAFTA by President Clinton and former presidents Ford, Carter and George H. W. Bush as they were featured together in this September 14, 1993 news report. “I believe that NAFTA will create American jobs in the first two years of its effect. I believe if you look at the trends … over one-third of our economic growth, and in some years over one-half of our net new jobs came directly from exports. And on average, those export-related jobs paid much higher than jobs that had no connection to exports. I believe that NAFTA will create a million jobs in the first five years of its impact. And I believe that that is many more jobs than will be lost, as inevitably some will be as always happens when you open up the mix to a new range of competition. Now here is President Bill Clinton at the NAFTA signing. Clinton said NAFTA will “promote more growth, more equality, better preservation of the environment and a greater possibility of world peace.” He also said it will “pull down foreign trade barriers” and that it will create 200,000 more jobs in the U.S. by 1995. Not only did promises made by NAFTA’s proponents not materialize, but many results are exactly the opposite. Such outcomes include a staggering $181 billion U.S. trade deficit with NAFTA partners Mexico and Canada and the related loss of 1 million net U.S. jobs under NAFTA, growing income inequality, displacement of more than one million Mexicancampesino farmers and a doubling of desperate immigration from Mexico, and more than $360 million paid to corporations after “investor-state” tribunal attacks on, and rollbacks of, domestic public interest policies. The study makes for a blood-boiling read. For instance, we track the specific promisesmade by U.S. corporations like GE, Chrysler and Caterpillar to create specific numbers of American jobs if NAFTA was approved, and reveal government datashowing that instead, they fired U.S. workers and moved operations to Mexico. … Mexico ranks 18th out of 20 Latin American countries in growth of real GDP per person, the most basic economic measure of living standards; Mexico’s poverty rate of 52.3 percent in 2012 was almost identical to the poverty rate of 1994; real (inflation-adjusted) wages for Mexico were almost the same in 2012 as in 1994; and unemployment has increased significantly. NAFTA led to a flood of outsourcing and foreign direct investment in Mexico. U.S. imports from Mexico grew much more rapidly than exports, leading to growing trade deficits… Jobs making cars, electronics, and apparel and other goods moved to Mexico, and job losses piled up in the United States, especially in the Midwest where those products used to be made. By 2010, trade deficits with Mexico had eliminated 682,900 good U.S. jobs, most (60.8 percent) in manufacturing. Claims by the U.S. Chamber of Commerce that NAFTA “trade” has created millions of jobs are based on disingenuous accounting, which counts only jobs gained by exports but ignores jobs lost due to growing imports. The U.S. economy has grown in the past 20 years despite NAFTA, not because of it. Worse yet, production workers’ wages have suffered in the United States. Likewise, workers in Mexico have not seen wage growth. 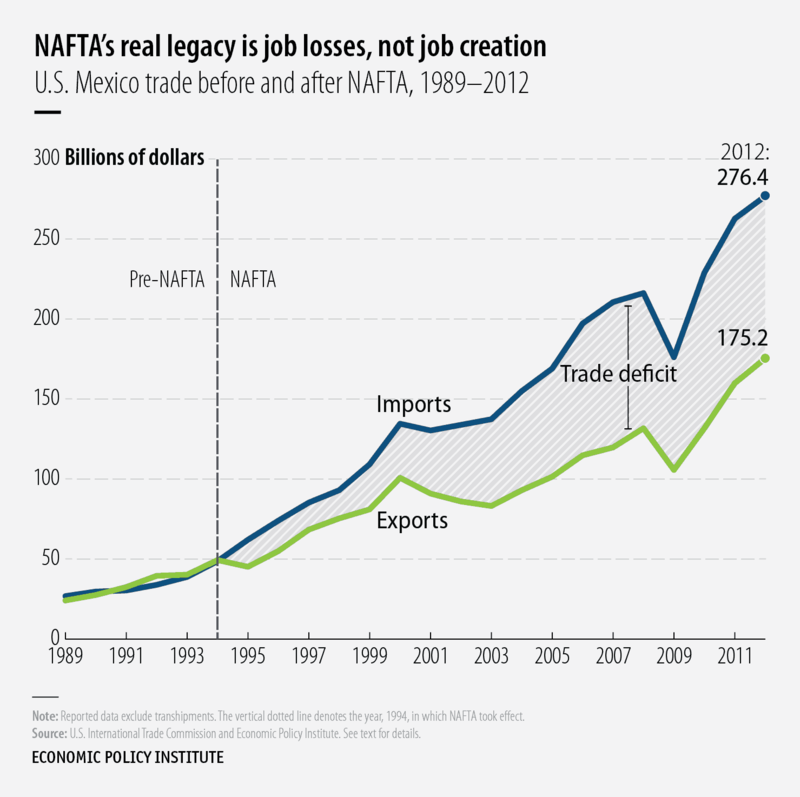 Job losses and wage stagnation are NAFTA’s real legacy. Today corporate lobbying groups and President Obama make the same promises about the Trans-Pacific Partnership. They say that it will increase the number of jobs in the U.S. by increasing exports. But they never mention that imports exceed exports, resulting in an enormous, humongous trade deficit. “Approving these agreements would put hundreds of thousands of Americans back to work, jumpstart our economy, and restore America as a global leader,” he said. TPP is a massive “trade” agreement with countries around the Pacific rim, including Vietnam. Vietnam has an average minimum wage of less than a dollar an hour. A September 2013 study by the Center for Economic and Policy Research (CEPR) titled, “Gains from Trade? The Net Effect of the Trans-Pacific Partnership Agreement on U.S. Wages,” looked at the effect of past trade agreements and estimated the effect of TPP. The study estimated that the TPP would force wages down (even more) for almost all U.S. workers. [CEPR’s] Rosnick shows that if we assume that trade has contributed just 15% of the recent rise in inequality (a still conservative estimate), then the TPP would mean wage losses for all but the richest 10% of U.S. workers. So if you’re making less than $87,000 per year (the current 90th percentile wage), the TPP would mean a pay cut. An additional worry is what would happen to Central American and Mexico and the effect of that on the U.S. NAFTA doubled migration northward as small farms in Mexican and Central American were wiped out. December’s post, Immigrant Groups Warn Fast Track/TPP Could Cause More Migration North reported on a call with the leaders of immigrant rights groups who warned that TPP could force a second northward migration as jobs in Mexico and Central America are moved to low-wage, low-rights countries like Vietnam. A new AFL-CIO report released today finds that four nations that would be major players under the Trans-Pacific Partnership (TPP) are out of compliance with international labor standards and, therefore, with the commitments they would undertake under the TPP. The report—The Trans-Pacific Partnership: Four Countries That Don’t Comply with U.S. Trade Laws—finds that workers in Mexico, Malaysia, Vietnam and Brunei face ongoing and systematic abuse and violations of workers’ rights with the complicity or direct involvement of the governments. The report points out that previous FTAs have forced countries to compete on the basis of lowering labor costs and attracting business by ignoring, or in some cases actively interfering with, the fundamental labor rights. By not requiring fundamental changes of these countries first, the TPP gives away leverage that could be used to protect workers and raise standards. If workers do not have the legal freedoms to act collectively, they will not be able to exert the power needed to raise wages, increase worker protections or gain the social policies necessary for the creation of a middle class and broadly shared prosperity. The president and corporate lobbyists promise that TPP will have strong labor standards to protect Americans from having even more jobs shipped overseas. However, TPP is being kept secret, even from congressional staff who could analyze these promises. TPP will be pushed through Congress using “fast track” trade promotion authority that allows Congress only 90 days to debate and conduct an up-or-down vote after it and the public first see the agreement. This does not give Congress and the public enough time to read and fully understand this enormous, complex agreement and especially not enough time to consider the ramifications on our economy and our working people. The question to ask is, if this agreement is so good for us, why is it kept secret, and why are they insisting on rushing it through before the public has time to understand it and rally opposition if opposition is warranted? Here is Barack Obama campaigning in 2008, saying that corporate lobbyists negotiated trade agreements like NAFTA and we need to renegotiate it. In five key policy areas, Clinton has maintained positions to the right of liberal – and certainly not progressive.